Hi Buzzer readers, a few weeks ago we started a conversation about the future of transportation in our region. Considerations of health play a large role in transportation planning for our region. Did you know that every hour you spend in a car each day makes you 6% more likely to be obese? And, every hour you spend walking each day makes you 4.8% less likely to be obese? Taking transit encourages commuters to walk or cycle to a station or a stop, so by choosing active transportation, you can fulfill more than 25% of your daily required physical requirements. As research shows, sedentary lifestyle is a major cause of many chronic diseases such as obesity, heart disease and some cancers. Many chronic diseases are preventable and sustainable transportation choices offer the possibility of prevention and even treatment through increased physical activity. We are rethinking transportation and the health, economic, environmental and lifestyle benefits it has for the region. The research report “Transportation and Health: Context Report”, published by UBC’s Health and Community Design Lab, and funded by TransLink and Vancouver Coastal Health Authority, shows that transportation and health are closely linked and health outcomes need to be considered in transportation planning. This report is a part of the process to update Transport 2040, the current regional transportation strategy. In Transport 2040, the region agreed that the most affordable and efficient way of achieving our livability, economic and environmental goals would be to make it possible for people to make half of all trips by cycling, walking and transit and to reduce distances driven by one third. We believe that if we achieve those two goals, our population will be healthier, economy will be more stable and our air will be cleaner. What do you think? 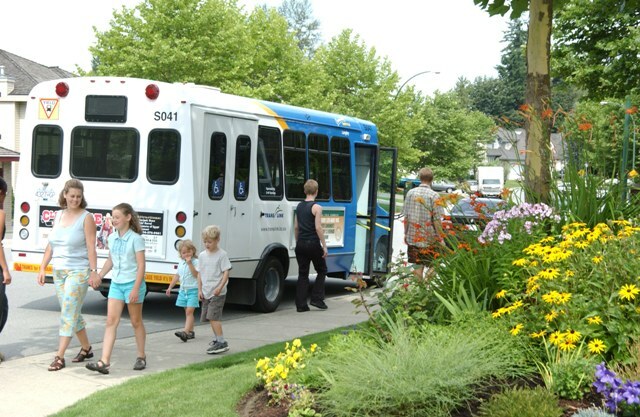 Fill out the survey on translink.ca/rts so you can be part of the plan. At a time when fares go up, and when you are not adding new service, you take stock photos. I can only assume that you everybody in the photo got paid. I also assume that photographer got paid. That money should be spent on marketing to generate *new* ridership, instead of preaching to the choir. We should file a complaint. Oh come on now Eugene, play nice. Just like all the car drivers do when cyclists have to ride on the road because there’s not enough cycling infrastructure. It’s not as if cyclists have to ride on the sidewalk because they’re risking their life by riding on the road. It’s difficult to abandon my vehicle in an area poorly served by transit. (and as of next year, no longer served at all). The terrain does not lend itself to cycling or walking, requiring steep climbs in both directions to get to the store and/or nearest bus stop. While climbing steep hills everyday will no doubt improve one’s health, this is no substitute for convenient and frequent transit service and is far from reasonable. Walking, cycling, and transit may work great in places like Vancouver, Richmond and Burnaby, but the goal of TransLink is to serve ALL of Metro Vancouver. And while ridership numbers go up in these areas, vehicle use will only increase in areas where transit funding has been cut back. Reducing service and telling people to walk and cycle more is a bit of a cop out for running actual buses. It really feels like TransLink has forgotten there’s a whole metropolis they need to serve sometimes. I wonder if the Evergreen Line will result in further reductions in transit service under the guise of “doing more with less”. Hi Cliff, thanks for your comment. You make a valid point about the challenges of commuting in the region. We know that presently one third of all trips in Metro Vancouver are carried out by active transportation and the remaining two thirds are conducted by cars. We also know that over the next 30 years, our region will welcome one million more people, adding half a million jobs and three million more passenger trips every day. If we want to keep our quality of life, we have to make transportation system work better – via all modes that make sense for people. As a region, we need to rethink transportation, taking a great consideration of health, environment and economy. That’s why we have started a public dialogue about regional transportation on translink.ca/rts and we welcome your feedback. The survey is now closed but the public consultation is continuing so please send us an email at: sandy.young@translink.ca. I hate to split hairs, but don’t you think that “forgotten” is a bit of an inaccurate word?